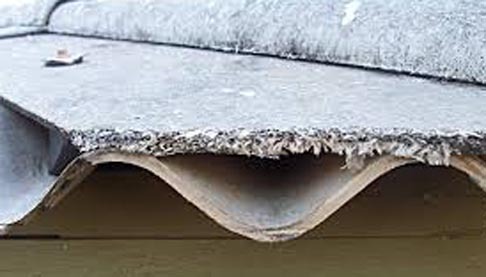 Asbestos was widely used as a building material in the second half of the last century, and can be found in many homes, schools, shops, hospitals, leisure centres, hotels and factories across the country. It was also used in car brake linings, fire blankets, heat-resistant clothing and ironing boards. Blue (Crocidolite) and brown (Amosite) asbestos were banned in the mid-1980s. but white asbestos (Chrysotile) continued to be used until late 1999 when it was also banned. Asbestos is, therefore, present in many homes. However, it will not cause any harm as long as it is left undisturbed and in good condition. Cement roofing sheets (outbuildings, garages). Heater cupboards (redundant or currently in use). Stud partitions (hiding pipes etc). Toilet flush box (black thick plastic appearance). Porch or door canopy linings. The law does not require asbestos to be removed unless there is a change in its condition and it poses a significant risk to health or, if there is a significant risk of exposure to asbestos as a result of any maintenance or refurbishment activities. All DIY works to your home must be approved by us first. If it is likely you will come into contact with asbestos, you should get in touch with our experienced Health and Safety Co-ordinator who will advise you how to work safely with it. It is important you tell us if you notice a change in the condition of any materials that you suspect to contain asbestos, so that we can take appropriate action. Our Asbestos in the home leaflet and Health and safety handbook for tenants in the ‘Library’ gives more information about asbestos and what you can expect.